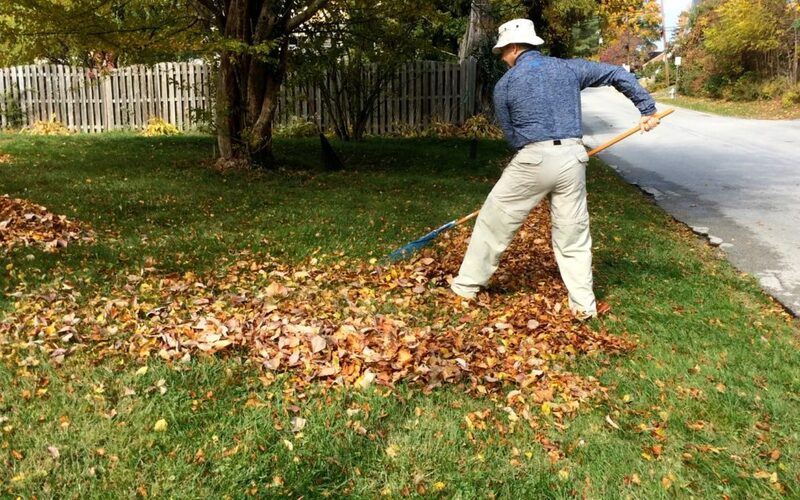 The safe way to rake leaves is to let your arms and legs do the work. Do not twist your body, or sweep to the side. Sweeping to the side requires twisting of the body. This creates torsion forces on the muscles, joints and other tissues protecting the spine. These torsion forces are unnecessarily strenuous, and damaging to your spine. Keep your movements in the forward and backward direction only. 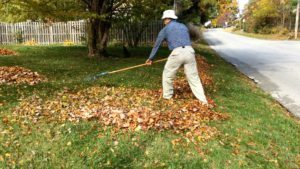 When you rake leaves, using good body mechanics will likely be more tiring to the arm and leg muscles. This is preferable to creating acute and/or chronic back pain. In other words, if your legs get tired with the lunging type movement (read below for how this works), it is time for a break and not to start twisting with your back to save your legs. This is why maintaining a good level of fitness is important. Your leg muscles can be trained to have the endurance and flexibility to do more lunging. Whereas, over stressing your back will create pain and disability. Speaking of maintaining a good level of fitness, healthy and strong abdominal muscles are crucial to protecting your back. It is imperative to know how to use your abdominal muscles to stabilize and protect the spine. Click here for more about abdominal muscles. Proper use of body mechanics always requires you to keep your work close to the body. Don’t reach out too far by bending at the spine. Use your legs and arms only for the reach. So, keep your spine upright and straight as you lunge with your legs and reach with your arms. This lunging is really short steps with a little reaching of the arms. Gather the leaves into piles by pulling them toward you. Raking is a very repetitive movement and there is no way around that. Alternate your leading hand and foot frequently to share the load evenly on your muscles between the right and left side. This link to my Youtube video will demonstrate the key points I’m suggesting here. 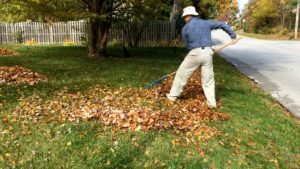 An important note: The benefits of using good body mechanics when raking are lost if you then lift all those leaves into the yard bags with poor mechanics!! Use your legs to do the lifting as you keep your spine straight. See here for video demonstrating this movement. In conclusion: What can you do to prevent back pain? Pace yourself. Take breaks to rest when your muscles are tired. This is a good time to do some light stretching. Stretching and flexibility exercises are best done to loosen muscles that have been worked and are still warm. They may be incorporated in your warm up if you feel tight before starting your work. Visit the Stretching category in this blog for instructions on stretching properly.